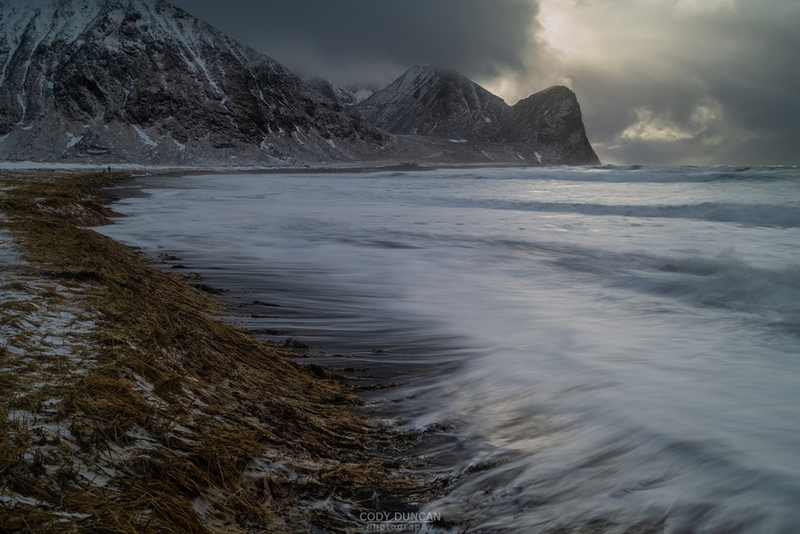 The past weekend’s storms brought some big seas to Lofoten. I headed to Unstad beach a couple times for some wave watching. Impressive indeed, and unfortunately, it’s quite hard to take a photo which shows the proper scale – and it was probably a little rough for any surfers to be out! At high tide, the waves were especially impressive, washing well up the normally flat sandy beach. 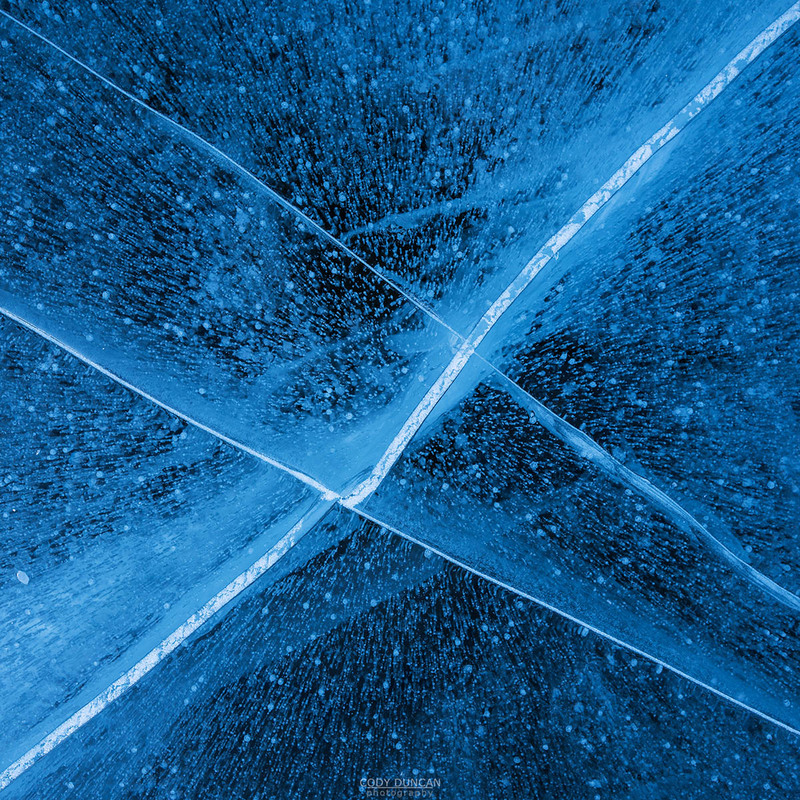 If you have never seen or been to Unstad before, then this photo might not show too much. But in fact, this small cliff doesn’t normally exist. Around a meter or so of sand has been washed off the beach during the storms. Quite a lot! The sand will return eventually and the beach will be back to normal. But for now, it will have a different look, with rocks where there normally aren’t any, as they are typically covered in sand. It is always impressive to see the raw power of the ocean. Looking out the cabin window in the early dawn light it was obvious there would be no sunrise this morning. As we neared Unstad, a light snow began to fall, covering the landscape in a light dusting of white. After some time photographing at the beach, I headed back to the rocky part of the coastline. 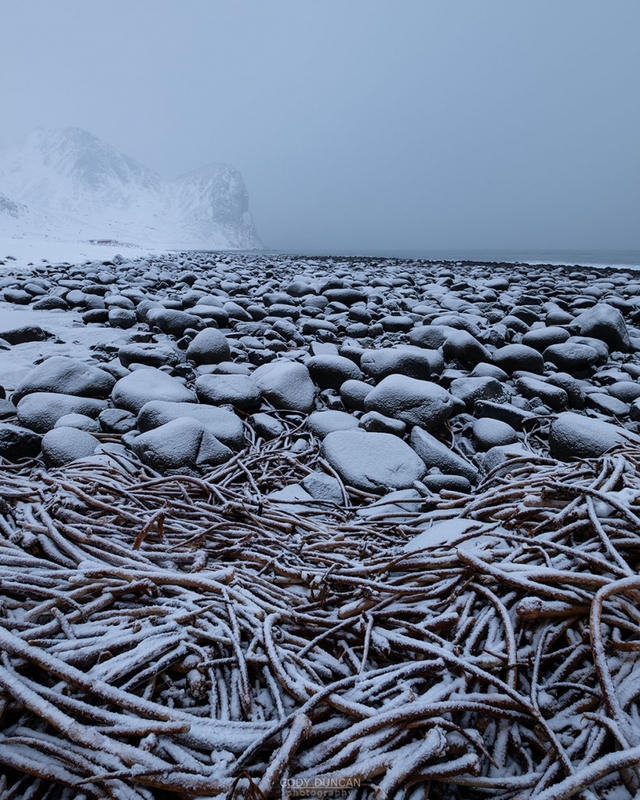 There have been several big storms this winter, so a lot of seaweed is currently washed ashore on all the beaches, with huge piles still remain at Unstad. Normally I find the seaweed an annoyance and somewhat ugly. However on this morning, the light layer of snow turned it into an seemingly random series of lines, which I though contrasted well with the rocks and the rest of the flat grey light. In any other conditions I probably never would have taken this photo. But here, on this morning, it was something interesting. 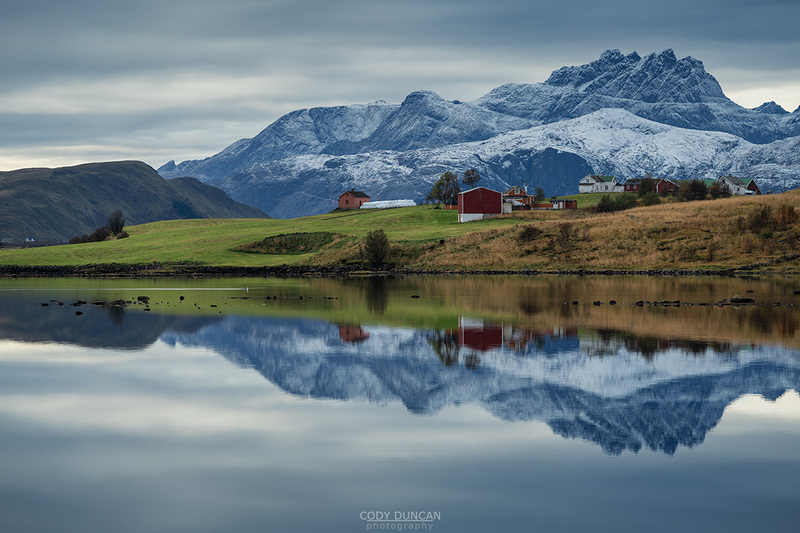 Photo: Snow covered peaks of Stjerntind rise in the distance over a small farm, Vestvågøy, Lofoten Islands, Norway. October 4, 2018. After nearly 6 weeks of seemingly non-stop rain, snow, and storms, the weather has finally calmed to a windless blue sky over the last days. Not that I want the bad weather back, but I dare say it’s almost a bit boring. And with my final photography tour of the year having finished over the past weekend, I can finally head back out to the mountains, which are now covered in a nice coating of white. It almost feels like winter is here, but not yet, we still have to get through November, my least favourite month of the year here on Lofoten. Lofoten was lucky this year, that amongst all the rain, the islands also received an early snowfall – I already posted about the first snow on Friday Photo #299. From my memory, I think 2009 was the last time I experienced this amount of snow already during late September and many of the last years have had quite mild autumns actually. But this year, the cold came early to the mountains, though luckily, the streets remained mostly ok here in west Lofoten until this past Monday, when the first major snowfall came – and I finally had to change to my winter tires, which will now stay on for the next 7 months – a slightly depressing thought for someone from California! 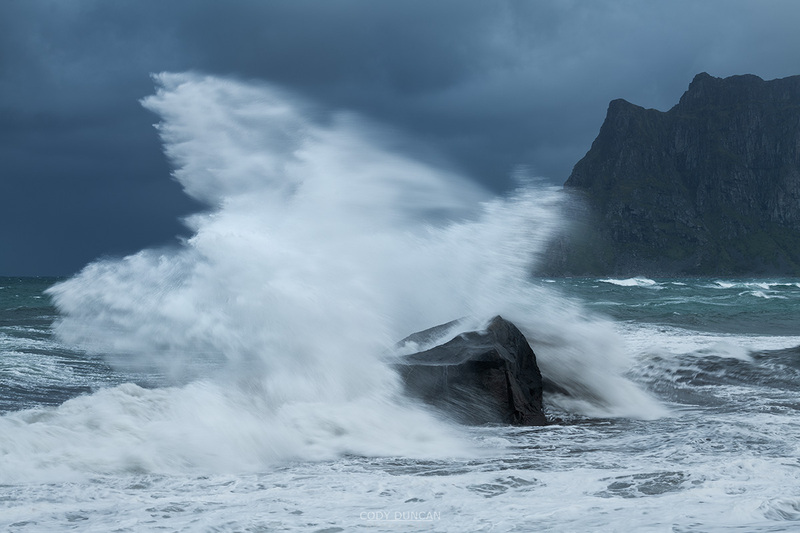 To say this autumn has been stormy on Lofoten would be an understatement! For over a month now, there has hardly been a day without rain, and gale force winds seem to be sweeping across the islands on a weekly basis. I’ve been guiding workshops almost non-stop for the last 4 weeks, and there has only been 1 day where I wasn’t wearing rain pants – something I generally don’t like to wear! But this bad weather has meant that the islands have been anything but boring! Last year, the weather was a bit too good, which is nice for camping, and northern lights, but otherwise, blue sky is not too interesting for photography. 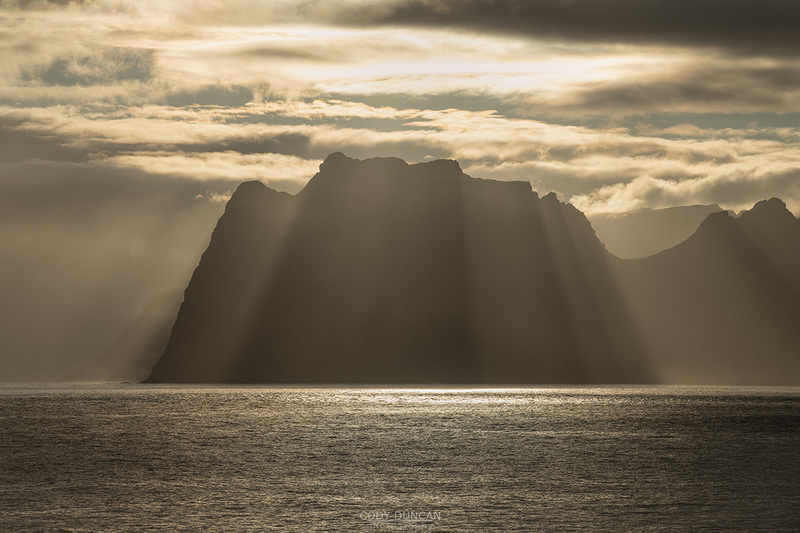 This year, the autumn storms have brought endless drama to the islands: Waves are crashing, the sky is filled with rainbows, early snow on the peaks (mostly gone now since it became a bit warmer), and an endless variety of light. At times it has been almost impossible to stand, and keeping the lens free from rain and sea spray is a constant fight. This image is from a stormy day at Uttakleiv on my first workshop in mid September. Usually I hate this rock, as I often find it distracting compositionally to many scenes here, as it always seems to end up somewhere in the frame or in front of the mountains. On this day, however, I’m glad the rock was there! I had been shooting some other stuff with my group, but I was struggling to convey just how stormy it was with what I was shooting. But seeing a constant flow of waves crashing over the rock, I decided that might be the image I was looking for. Of course, as soon as you change lenses and set everything up, the huge waves that were crashing just a few minutes ago seem to die out. So I spent a bit of time waiting for the right wave to arrive, then quickly fire off a series of images, hoping to capture a nice moment. There is almost no predicting the sea, so it is shoot, shoot, shoot, then delete, delete, delete once you’re home and looking at all the rejects and. But hopefully, out of the 50-100… images, there is something nice. This wasn’t the biggest wave of the day, but I like the shape and form of the splash and think it shows what the day was like out there. 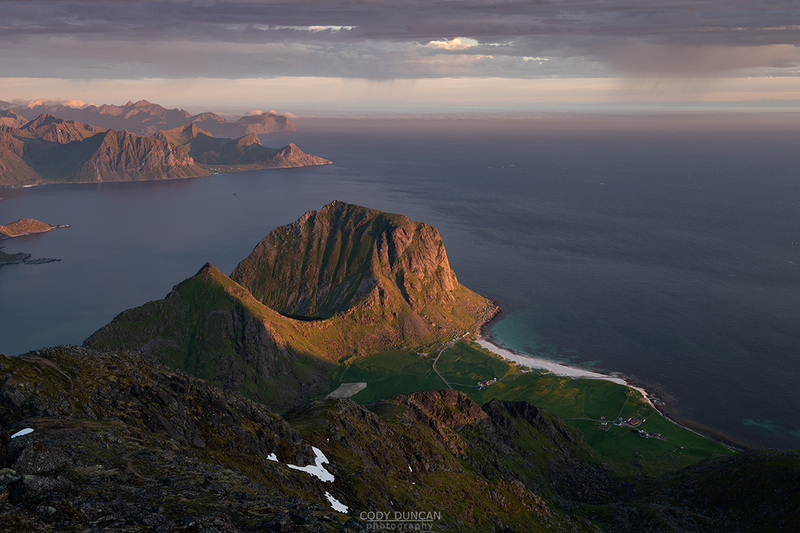 With July almost halfway over the midnight sun will soon be disappearing from Lofoten. And while the Islands lose light by about 1 hour per week until the sun sets for the last time of the year in early December, there is still another month of so before I’ll need to pull out my headlamp. Or, usually it is during a night out in mid August that I notice it’s a bit dark, and then it takes another trip or two before I actually remember to pack a light. But for the time being, I stay up late and wake up late. The beauty of summer here at the moment is the late nights. And even if I’m lazy, or stuck in front of the computer until the early hours of the morning, I always take a look out the window and see what the light is up to. I’m just back in the door from my first photo tour of the summer where we hiked 5 mountains over 6 days, with one day spent down low due to weather. I must say this was quite lucky, with the summer Lofoten has been having so far this year, as I somehow managed to time the tour with the only week of good weather! And on this day especially, it was t-shirts and sweat in the evening sun as we made our way up the 931 meters to Himmeltind, the highest mountain on Vestvågøy. Once at the top, the time for waiting began, taking photos every now and again, until the sun was low on the horizon – or, as low as it gets at this time of year. Eventually a layer of clouds began to fill what had been a nearly cloudless blue sky. And and soon some distant waves of rain began to appear on the horizon. The previous night, a cool sea fog and mountain clouds had arrived over Lofoten after around 02:00. So we stayed up, in hopes of this. But the fog seemed to be approaching at a glacial pace. So once the clocks hit 02:30, we decided to head down. Shortly after a gentle rain began, which turned into a heavy downpour just minutes before reaching my van. Good timing I guess! My final photo workshop of the winter season ended early Monday morning, it what was probably the worst weather of the entire winter thus far. Compared to last year, 2018 was a dream season – though a little more snow would have been nice. But weather wise, there were no ‘indoor weather’ days until this past weekend. 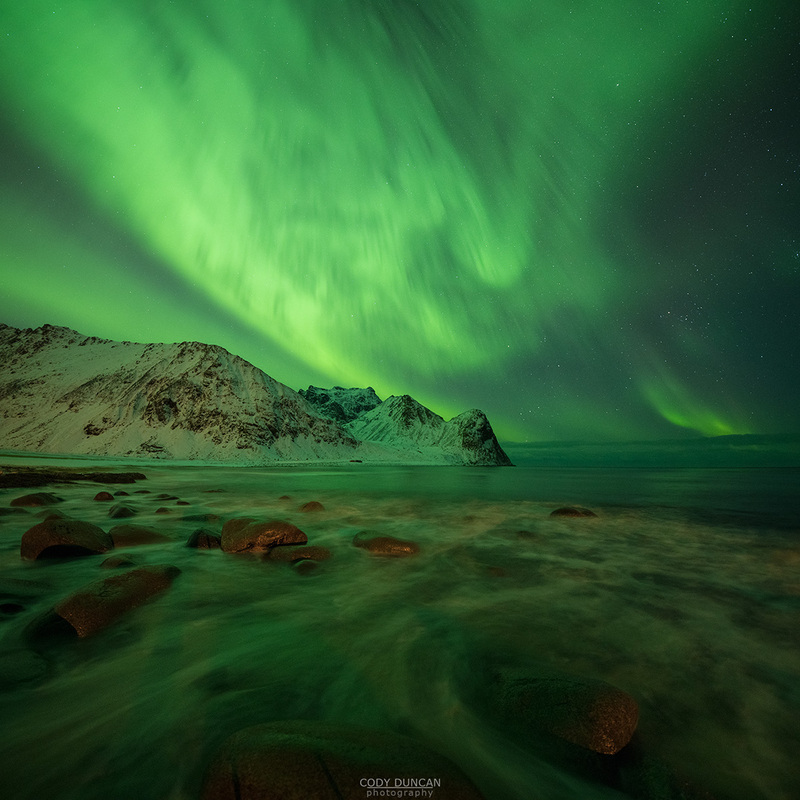 And good weather on Lofoten means lots of green at night. 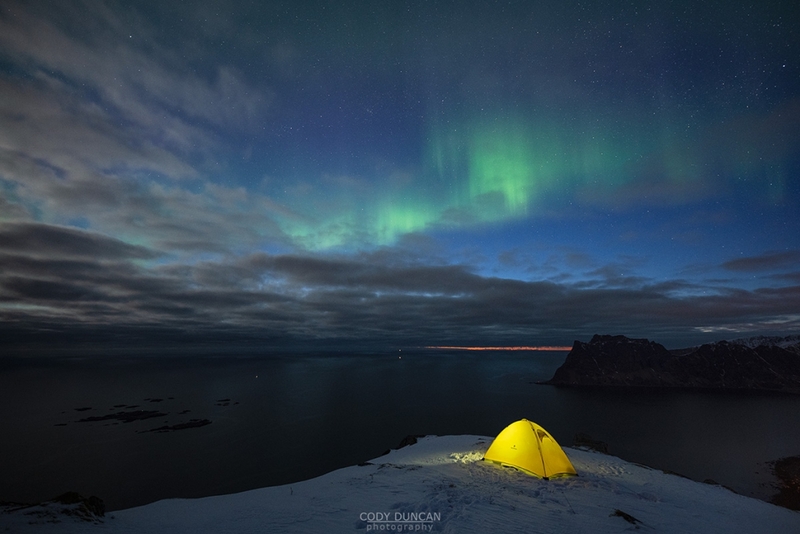 Every trip managed at least 2 nights of decent northern lights, while a couple tours got lucky with some solar storms – such as this photo from last week. 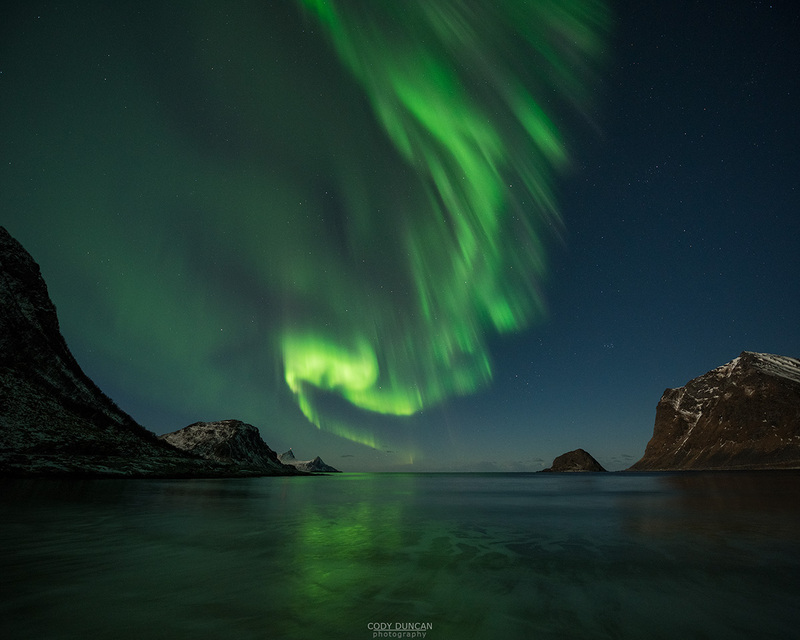 We started the night at Storsandnes, but as soon as I saw what the lights were doing, I made a quick decision to head over towards Vik beach, where we remained for some time until the sky grew quiet. Next was a quick stop at Uttakleiv, but the entire beach was fully of blinking camera, so we headed for a slightly long drive to Unstad – where we had the beach to ourself somehow. Even as we were arriving, the aurora had picked up again. And as we made our way down to the the beach, the entire sky began to fill with light. Another one of those nights where you don’t know which direction to look. Just before the last tour I had finally made some much needed equipment upgrades as well: Nikon D850 + Sigma 14mm f/1.8 lens. I should have bought this lens at the beginning of winter! It might not seem like much, but that extra 1.3 stops of light can make quite a difference. In this shot for example, I was at 4 seconds, where I would have been 8 seconds with a f/2.8 lens. Quite a difference! And I could have shot even faster had I raised the ISO beyond 1600. Sadly, there is only a few more weeks left in the aurora season. So I will try to make the most of things in the days to come. Though the lens is a beast! So I’m not sure whether I will attempt to carry it up any mountains – and unfortunately, it doesn’t replace the 14-24. I posted a similar image to this the other week – Friday Photo #268 – where the moon was directly over the beach. A couple weeks later, and the moon was more or less behind me, and out of the scene. This night was quite amazing, with the aurora dancing with stunning speed and filling the sky from horizon to horizon! With nearly full moon lighting up the landscape, it was possible to shoot with a relatively fast shutter speed of 2 seconds, which for northern lights is pretty good! On nights like this, 14mm is simply not wide enough. I want to show what is happening in the sky, yet I also want enough of a foreground to anchor the image and make it a decent composition. So I was shooting foreground and sky images in quick succession – it is important to be fast when the aurora is dancing so quickly, otherwise the reflections might not line up correctly if the aurora has moved between shots.